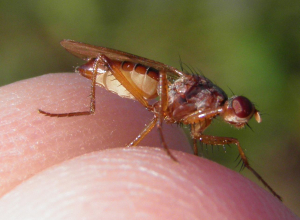 This fly was first found in Britain in 1965, and is likely to have been introduced to this country in daffodil bulbs, in which its larvae develop. It's mostly know from the south-east, but there are a few records elsewhere, and Malcolm Smart of the Dipterists Forum is currently seeking further records. The fly can often be found sitting on the leaves of daffodils, and if you get a close look at it the spiny legs are distinctive. It can be confused with the related Yellow Dung Fly which can sometimes be seen in similar situations.